Verizon said that 45,000 picketing union members could lose their medical benefits by the end of the month. NEW YORK (CNNMoney) -- Tens of thousands of striking workers from Verizon Communications will lose their medical benefits if they're still picketing at the end of the month, the telephone service provider said Wednesday. "I can confirm that the 45,000 striking Verizon workers did receive a letter confirming a provision in their 2008 contract that stated in the event of a strike, medical benefits would be suspended on Aug. 31," said Verizon spokesman Richard Young. "This should not be a surprise," said Young. "It's part of the contract that they've agreed to." Verizon (VZ, Fortune 500) said that health care will still be available to striking employees through the federally mandated health insurance program known as COBRA. "The only difference is that the cost will have to picked up by those who chose to walk off the job," said Young. "We believe if the striking employees are not serving the customers, our customers should not be expected to pay their benefits." Candice Johnson, spokeswoman for the Communications Workers of America union, accused Verizon of using scare tactics. "I'm not surprised that Verizon has taken this step," she said. "Instead of bargaining seriously and move off the $20,000 in compensation cuts it's demanding from every worker every year, Verizon is trying to scare workers." She said the union will assist workers in paying for health care services during the duration of the strike. The 45,000 union members have been picketing since Aug. 6 to protest the concessions that Verizon is trying to get from its employees. Those concessions include the elimination of two paid holidays, the freezing of pensions, the alignment of pay raises with job performance, and the union's contribution of $100 per employee towards health care premiums. The strikers are saying that Verizon, which reported a profit of $3 billion so far this year, isn't sharing the wealth and doesn't need to belt-tighten employee benefits. Verizon and other home phone service providers, such as AT&T (T, Fortune 500) and Qwest (Q), are looking to cut costs to compete with cable providers such as Comcast (CMCSA, Fortune 500), Time Warner Cable (TWC, Fortune 500) and Cablevision (CVC, Fortune 500). 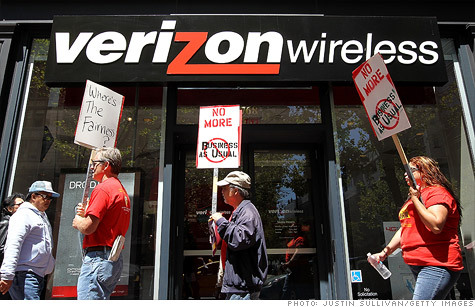 This is the first Verizon strike since 2000, when workers picketed for 18 days. The CWA urged Verizon chief executive officer Lowell McAdam to participate in the bargaining. With workers picketing outside Verizon stores, the strike has gotten ugly. The company has accused workers of deliberately sabotaging its infrastructure, while the strikers have accused the company of driving a vehicle into picketers. Both sides have denied these allegations. This is the largest U.S. strike since 2007, when 73,000 workers from General Motors (GM, Fortune 500) went on strike for two days. Many strikes last much longer. When the aircraft manufacturer Boeing (BA, Fortune 500) demanded similar measures from its workers in 2008, about 25,000 workers from the International Association of Machinists picketed for 57 days.